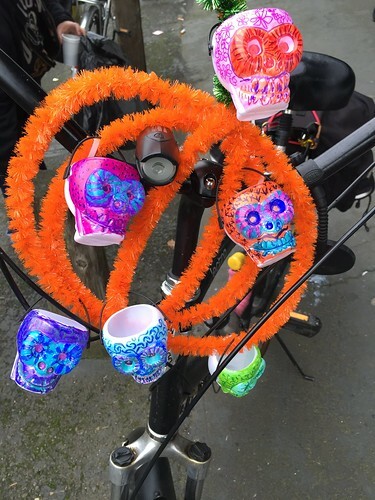 If there were a Tour de France for tiny tots, last Sunday’s Dia de Los Muertos ride would have been it. 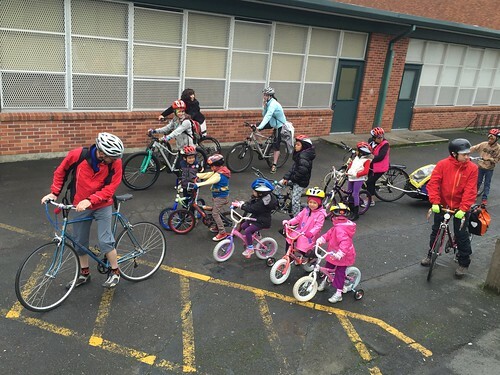 Kids of all sizes (but mostly small) gathered at Harvey Scott Elementary School on Sunday to sip hot chocolate–delivered on wheels by Icicle Tricycles–and get their drizzly bike ride on. 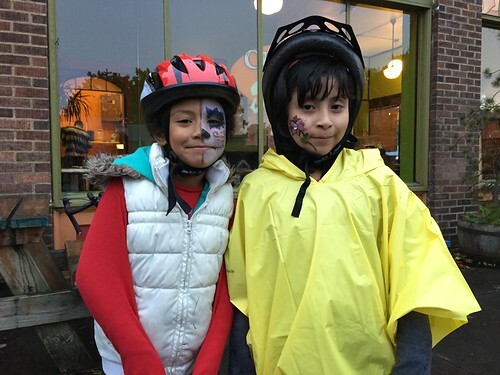 After an hour of mingling, face-painting, and helmet-donning, the kids and their adoring fans lined up to embark on an important mission: make it to the Dia de Los Muertos celebration before the tamales run out. 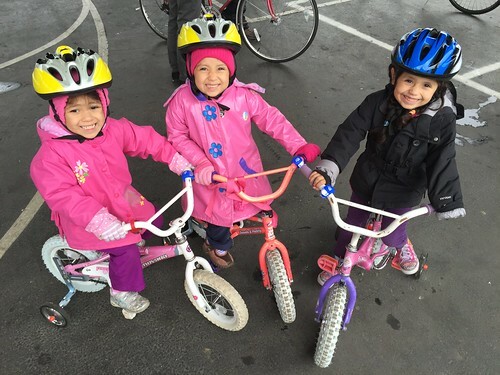 The ride was organized by Mujeres en Movimiento, with support from Andando en Bicicletas en Cully (ABC), the Bicycle Transportation Alliance (BTA), the Community Cycling Center, and Safe Routes to School. 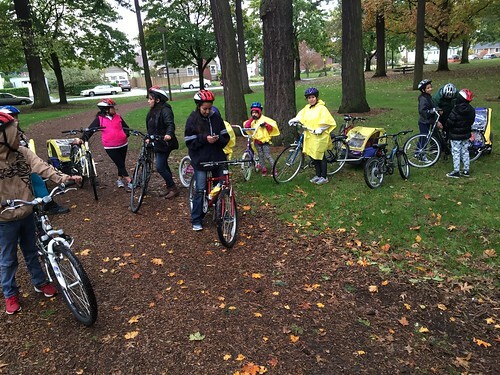 Through wind and rain and cross-country terrain, the fleet of tiny cyclists pedaled. Knuckles went white, training wheels came unhitched, but no tears were shed: this was a team of professionals. When we arrived at the site of the party, the mini-cyclists headed straight for the hot chocolate – because one can never have enough. Once their thirst was quenched, those who hadn’t already painted their faces hopped in line; others zeroed in on the coloring station; one burgeoning videographer took her phone around the perimeter to document the colorful altars and festive decorations. The adults gathered around the coffee (how else were we to keep up?? ), and sampled several varieties of tamales. Finally, our wind-whipped cheeks and frozen fingers could thaw, and our bellies could refuel. When I spoke with Lisa, the owner of Roots Salon and the host of the party, she said this was the sixth annual party of this nature. It’s a celebration of life,” she explained. 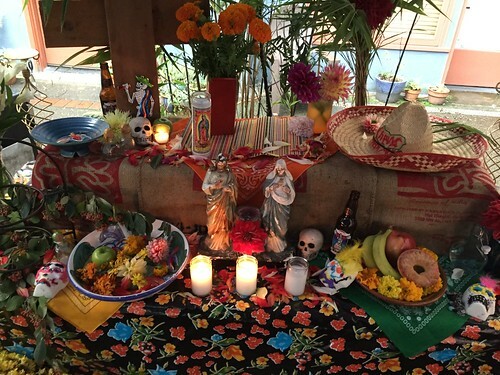 She told me Dia de los Muertos begins on November 1: All Saints Day. On that day, “we celebrate all saints [who have passed away].” November 2, she went on, “is All Soul’s Day: the day when we celebrate everyone.” The atmosphere was celebratory indeed – a colorful combination of joyful and reverent, lively and peaceful. I also caught up with Teresa Raigoza of ABC and Lale Santelices of the Community Cycling Center. Since my Spanish isn’t what it once was (let’s face it: it was never very good), Lale acted as translator between Teresa and myself. I learned that Teresa and Lale each serve their own bike communities. Teresa works with members of ABC to organize rides, workshops, and events with residents of Hacienda CDC. In addition to supporting ABC through her job at the Community Cycling Center, Lale–along with Elizabeth Quiroz, a member of the BTA community, and Carolina Iraheta Conzales of Safe Routes to School–created Mujeres en Movimiento (or “Women in Motion”), a group that encourages Latina women in Portland to get around Portland by bike. In our conversation, Teresa told me that this ride was their last big cycling event until spring. But don’t worry: Teresa and Lale assured me there will be other ABC events this fall and winter, including MacGyver bike maintenance workshops, social gatherings for NE Portland families and friends, and “Walk & Bike & Scoot to School” initiatives.